For close to two decades, researchers have discussed the prevalence of digital divide in the United States. Scholars have also proposed principles to bring about digital equity. The purpose of this chapter is to examine both conceptual and empirical reviews and studies conducted in this millennium to bring about digital equity. 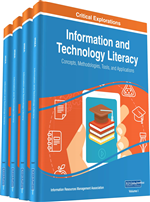 The chapter informs teacher education programs, researchers, school administrators, policymakers, teachers, and other stakeholders about evidences and recommendations to bring about digital equity in US K-12 and teacher education. The population projection for the United States as of July 1, 2012 was 313 million (US Census, 2012). According to the National Center for Education Statistics (NCES), in 2012, the population of the US over 3 years of age was 297 million, and out of this group, there were 222 million people or 75% who used the Internet (NCES, 2013). Of the persons who had neither high speed Internet access nor any Internet access at home, about 35% found the cost of the Internet expensive and about 11% did not have an adequate computer to access the Internet or did not have a computer. Additionally, people who had not graduated from high school, those living in the rural areas, and senior citizens—all adding up to millions of people in the nation—had slow speed Internet connections and limited choices. The American Community Survey Reports (2014) indicate that in 2013, 87% Asian, 78% White, 67% Hispanic, and 61% Black households had Internet connection, even as the US was the world’s leader in advanced wireless broadband Internet services, such as 4G LTE (White House, 2015). On January 14, 2015, President Obama declared, “Today high speed broadband is not a luxury, it’s a necessity” (White House, 2015, p. 1). In early 2016, the data available for Internet-access are of 2013-14; the US population data as of December 31, 2015, was 322 million (US Census, 2016). In terms of computer-ownership, 93% Asian, 85% White, 80% Hispanic, and 76% Black households own computers (American Community Survey Reports, 2014). Table 1 shows the data for income categories and percentages for computer ownership and Internet-access. The data for Internet-access, computer-ownership, and income groups for 2015-16, are likely to be different than those that are currently available. The available data-sets confirm that not every US citizen has access to the digital world and increasingly so in lower income groups.